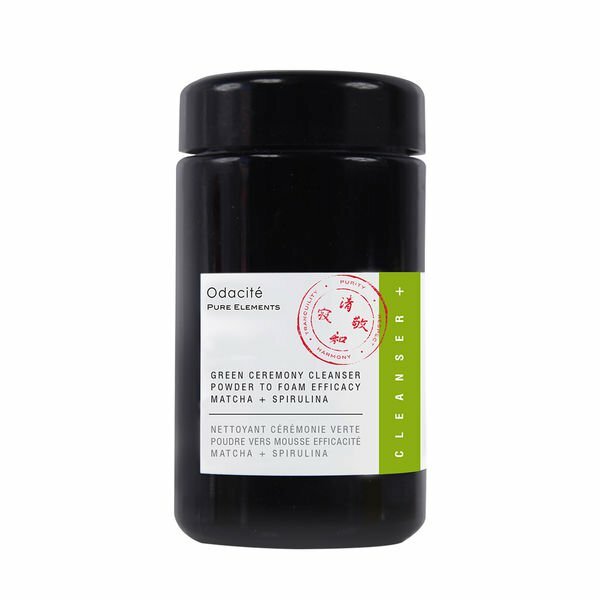 Born and raised in Paris, living in Los Angeles, Odacité was born in Topanga a magical canyon in Los Angeles Valerie Grandury sources only the best ingredients to produce the most effective products sans les toxins. Help revitalise and renew dull-looking skin with a set of serum treatments designed to target the causes of fatigue, with the Odacité Tired Skin Remedy Try Me Kit. This handy kit comes with everything tired skin needs to look as though it has been treated to some much-needed beauty sleep, and this easy-to-use kit contains a fabulous variety of remedies that cater to the skin’s current needs. 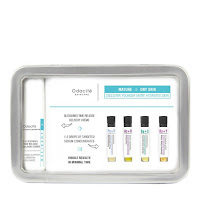 The Odacité Tired Skin Remedy Try Me Kit comes with Oléosomes Time Release Delivery Crème which uses an advanced formula to work as a time-release base for the serum concentrate. This means that the skin benefits from the serum’s goodness through day and night. 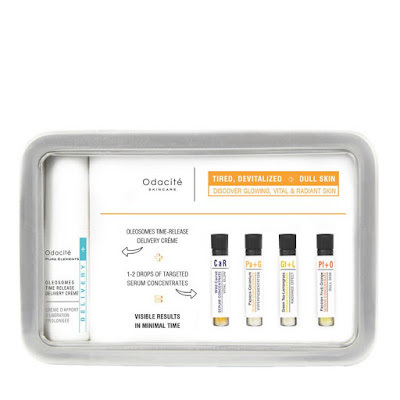 This kit also includes four different serum concentrates, all of which target problem areas for tired, dull-looking skin. Test a variety of serum concentrates for mature skin with the Odacité Dry + Mature Skin - The Ultimate Skin Remedy Try Me Kit. This set includes four different serum concentrates, as well as a time-release cream base to ensure even application. This set includes the Wrinkle Ro+Y Serum Concentrate which boosts collagen and helps skin stay firm and healthy. It also includes the Hydration Po+R Serum Concentrate which works to balance sebum production, control shine, and hydrate skin. To address all aspects of skin ageing, this collection includes the Youth Ac+R Serum Concentrate in addition to Eye Contour Ba+S specifically for the fragile skin surrounding the eye. Oléosomes Time Release Delivery Crème serves as a base for applying any of the serums. 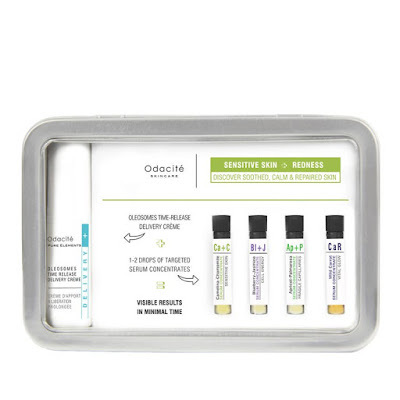 Give skin the treatment it needs and deserves with a set of serums which cater to the skin’s changing needs, all with the Odacité Sensitive Remedy Try Me Kit. Designed for use on sensitive skin, this kit contains Odacité’s unique Oléosomes Time Release Delivery Crème which aids the serum by releasing its properties throughout the day or night, thereby allowing for greater care of the skin. The kit contains four of Odactie’s serum concentrates, each of which work to reduce the skin’s sensitivity, inflammation and redness. With the help of these four hard-working serums, even the most reactive skin can be cooled, calmed and brought completely under control. Steadily deliver serum concentrates over the course of the entire day with the help of Odacité Oleosomes Time Release Delivery Crème. This facial cream works to provide ongoing delivery of both actives and moisture. The high-performing formula contains aloe vera to boost hydration levels, tea extracts, rich in antioxidants, to help slow the ageing process, and hyaluronic acid which works to reduce the appearance of fine lines and wrinkles. It also works to soothe skin inflammation with the help of calendula, and contains carrot seed oil to help revitalise skin. 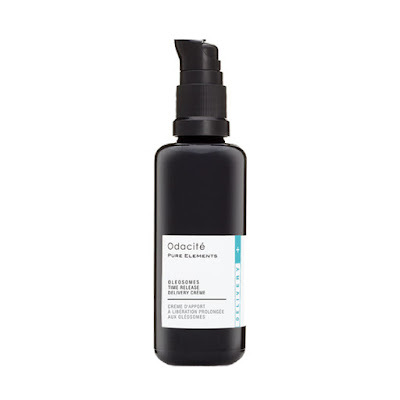 Providing skin with instant refreshment, Odacité Oleosomes Time Release Delivery Crème can be mixed with two to three drops of a serum concentrate to create a long-lasting skin remedy. A cleansing experience like no other-formulated with powder to foam efficacy and bursting with the power of Matcha + Spirulina. This treatment cleanser removes all surface impurities delivering a deep cleanse while respecting the skin barrier and energizing the skin. The Green Ceremony Cleanser applies to skin the four founding principles of the Japanese tea ceremony: purity, respect, harmony and tranquility. • Purity: Ingredients marry to create a remarkable fizzy purifying foam, removing excess dirt, oil, and dead skin, helping to treat acne-prone skin & reducing breakouts, while revitalizing mature/tired skin. • Respect: The high chlorophyll content of Matcha + Spirulina acts as a powerful detoxifier, while a gentle foam derived from coconuts= also known as baby foam-respects the delicate skin barrier, leaving your skin dirt-free and never tight. • Harmony: Concentrated Aloe Vera powder contributes to calm skin inflammation and redness, while Matcha + Spirulina offer their potent antioxidants to help reverse free radical damage and maintain fresh, youthful skin. • Tranquility: through the pleasure of transforming powder to foam and the delicious effect of massaging it into your skin, create a space to reconnect with yourself and discover a few minutes of much-needed tranquility amid daily stress. 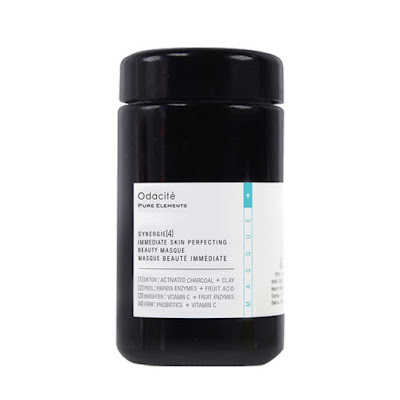 Give skin a complete makeover with a treatment mask that works on four different levels to reveal healthier, happier skin with the Odacité Synergie Skin Perfect Masque. Made with four cofactor ingredients, the Odacité Synergie Skin Perfect Masque has been designed so that each active ingredient works in synchronisation to target specific skin issues, thereby revealing an overall healthier complexion. Synergy 1 detoxes and purifies the skin, helping to reduce the appearance of enlarged pores and blemishes. Synergy 2 removes dead skin cells so that it appears healthy and refreshed. Synergy 3 uses vitamin C to help brighten and even skin tone, and synergy 4 supports collagen production, which works to make skin appear plumper.